These deals only have a few days left so check them out now as we have deals from Totally Costumes, Halloween Costume Factory, and Costume Supercenter. Get geared up for Halloween Now at up to 50% off! These deals all expire 10/8/2011 at 4am PST so hurry! This offer expires at 4am PST on September 21st so hurry. ABOUT NOVICA: NOVICA, part of the National Geographic family, partners with highly skilled artisans from around the world to bring customers a truly global collection of the latest trends in design. NOVICA designs have graced the pages of many fashion magazines including Vanity Fair, Vogue, and Elle. NOVICA is committed to fair trade, which empowers artisans to develop a viable business from their craft, enriching their local communities. This sale features specially selected accessories from some of the world?s most talented artists. The world is your market with Today’s TaDa. Shop the beautiful hand-crafted accessories from global artists at up to 46% off, today only from TaDa! Deal of the Day: Yamaha NeoHD media controller at an amazing $600.00 savings! I may never leave the couch again now that I have this NeoHD. Now you can get a fantastic deal on this Yamaha YMC-700 at just $179.99 you save $320.00! This is the NeoHD WiFi Media controller amazing deal it was originally 799.99 marked down to 499.99 and with the promo code below you get another $320.00 off! Simplicity is key with the neoHD YMC-700 Media Controller. Say goodbye to the complex controls, settings and connections you would normally find on a standard receiver. The neoHD streamlines your audio experience so all you have to do is sit back and enjoy the 5.1 channel surround sound. The Media Controller features several sound options to accommodate your listening preference, including Position Mode, Wide Mode and virtual 7.1ch mode. Take advantage of the built-in Wi-Fi connection or Ethernet port to enjoy streaming audio with Rhapsody. Your movies and music will sound amazing with the latest Dolby TrueHD decoder that delivers lossless quality. The Media Controller also features dts Digital Surround for excellent audio immersion. Connect your favorite entertainment accessories, like Blu-ray disc players, DVD players and gaming consoles, with four HDMI connections that will upconvert analog video. Enjoy high-definition 1080p resolution with a compatible HDTV. Fantastic deal from Newegg for 2 days only. This is not such a promising week to be picking out DVD’s. There is the likes of Jackass 3D, but really if you have seen one, you have seen all of them. Somewhat interesting is Every Day, a dramedy sleeper about familial bonds and obligations–It somehow manages to be both real and outlandish. – The Backyardigans: We Arrrr Pirates (Animation, Family, TV) Buy Now! – Bazaar Bizarre (Crime, Documentary, Thriller) Buy Now! – The Chaperone (Action, Comedy) Buy Now! – Colin Mochrie & Brad Sherwood: Two Man Group (Comedy) Buy Now! – Dalziel and Pascoe: Season 3 (Crime, Drama, Mystery, TV) Buy Now! – Daniel Tosh: Happy Thoughts (Comedy) Buy Now! – Doctor Who: The Ark (Adventure, Drama, Sci-Fi, TV) Buy Now! – Doctor Who: The Seeds of Doom (Adventure, Drama, Sci-Fi, TV) Buy Now! – Every Day (Comedy, Drama) Buy Now! – The Fernando Di Leo Crime Collection (Crime) Buy Now! – Four Lions (Comedy) Buy Now! – Hannah Montana Forever: Final Season (Comedy, Family, TV) Buy Now! – Inside Job (Documentary) Buy Now! – Jackass 3D (Single-Disc Edition) (Comedy) Buy Now! – Jackass 3D (Unrated Limited Edition) (Comedy) Buy Now! – Judge John Deed: Season Three (Crime, Drama, Mystery) Buy Now! – Kenny Chesney: Summer in 3D (Documentary, Music) Buy Now! – The Man From Nowhere (Action, Crime, Thriller) Buy Now! – Morning Glory (Comedy) Buy Now! – The Next Three Days (Thriller) Buy Now! – NFL Super Bowl XLV: Green Bay Packers Champions (Sports, TV) Buy Now! – Rage (Thriller) Buy Now! – Rediscover the Ancient Mysteries of Egypt (Documentary) Buy Now! – SpongeBob SquarePants: The Great Patty Caper (Animation, Comedy, Family) Buy Now! – Tales from Earthsea (Animation, Adventure, Fantasy) Buy Now! – VeggieTales: ‘Twas The Night Before Easter (Animation, Family) Buy Now! – The Walking Dead: Season One (Drama, Horror, TV) Buy Now! – The Zombie Farm (Horror) Buy Now! Meet Roboni-i, a highly-intelligent robot that fuses interactive, remote-controlled gameplay with advanced robotic technology. Operated wirelessly using a handheld controller and featuring four processors and 16 sensors, Roboni-i can sense and respond to his environment, explore the room on its own, and even engage in games with other Roboni-i units. A great toy for young robotics enthusiasts, Roboni-i can also be linked to your computer, allowing to reprogram his behavior and upload customized games. With his futuristic architecture and space-age silver color, Roboni-i would fit right at home in a science fiction movie. He features a durable plastic chassis that protects his intricate inner technology. Inside of Roboni-i are 12 infrared sensors, which the robot uses to sense his surroundings, "talk" to other robots and communicate with the included BaseStation. He also features highly-sensitive touch sensors on his front and back bumpers, allowing him to sense even the slightest physical contact. When Roboni-i senses something, he responds immediately by executing complex behaviors. For instance, if he collides with a wall, he’ll whistle with displeasure, turn around, and proceed in the opposite direction. If he spots his BaseStation or another Roboni-i unit, he might fire off his laser. If left by himself for more than 30 seconds, he may even begin to explore the environment on his own. He’ll always remain near his BaseStation, though, so you don’t have to worry about him wandering off by himself. With a full, 360-degree range of motion, Roboni-i is incredibly agile. 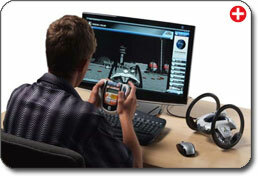 You control Roboni-i using a comfortable handheld controller, which communicates wirelessly with the robot. The controller’s LCD screen displays various aspects of the robot’s status, such as his level of "happiness," his battery life, current game mode, and so on. The robot is surprisingly fast, and he’s even capable of stunts and loops. Keep in mind that his plastic frame houses complex electronics, so don’t get too wild with your stunts. He’s by no means an all-terrain vehicle and is best driven on a hard, flat surface. Roboni-i isn’t just a mindless automaton that you control. He is a moody, sensitive robot that seems to have a mind of his own! He is at his happiest when he gets lots of attention, and when he is in close vicinity to his BaseStation. If you switch his BaseStation off or move it out of reach, he will have a robotic "freak-out" and begin frantically searching for it. When he’s in a good mood, he will randomly fire off his laser, run away and "hide" from you, and perform other playful acts. When you pay close attention to Roboni-i, you earn "RoboTX" levels — a measure of how much your robot trusts you. As you earn more and more RoboTX levels, your robot will gain access to more advanced actions and movements. This is a fun feature that allows your robot to grow dynamically with you as its owner. However, it also requires you to invest time in playing with your robot in order to get the most out of the toy. Using the included Command Center program, you can customize the way your Roboni-i reacts to different stimuli. The program is very easy to use, although it does take some degree of computer competence (which younger kids may not have.) A drag-and-drop menu lets you easily program your robot to reverse, spin around, crabwalk, flash its activity LEDs, and more. The program also comes with a comprehensive tutorial, making it easy to learn how to use your robot. The Command Center program is compatible with Microsoft Windows XP, Vista, Windows 7. It is backed by a 1-year limited warranty. One-Piece Nano Charger and FM transmitter is ultimate choice for travelling ipod fans. Enjoy it’s compact size, light weight, sound clarity and simplicity to use. Attach the DC adapter to your car’s cigarette lighter, and play music through car speakers while the attached charging cord keeps your iPod battery charging .Every product is made with exceptional quality and protected with 3 year manufacturer’s warranty. Great for your Ipod Video, IPod touch, IPhone, Nano, and Classic . Not compatible with the Shuffle. This product is not affiliated with Apple, Inc. The terms "iPod" and "iPhone" are used for compatibility purposes only. iPhone and iPod trademarks are the property of Apple Inc.
Offering a redesigned chassis with a sleeker body, the nicely affordable Toshiba Satellite L645D-S4036 notebook PC makes it easy to handle computing essentials at home, school or work–from surfing the web and downloading video to managing household finances or studying for finals. And its high-gloss Fusion Finish in Helios Black will be sure to raise a few eyebrows while you’re on the go. You’ll also be able to burn through the hottest new digital media, content creation and advanced 3D gaming thanks to the triple-core AMD Phenom II Mobile Processor P820. This all-purpose, eco-smart machine features a stunning 14-inch LED-backlit display with 720p native high-definition resolution. Thanks to the built-in webcam and Toshiba Face Recognition software on this machine, you’ll enjoy a more convenient way to communicate, log on or share your laptop among the family. Other high-tech features include a power-saving Eco Utility to help reduce power consumption based on your needs and one USB/eSATA combo port. Fantastic deal on this Cuisinart 6 slice toaster oven. Retail price is $132.99 today until midnight it is just $59.99 save $73.00!